MaiTai's Picture Book: Guest post by Gina: How-to for the Papillon knot! 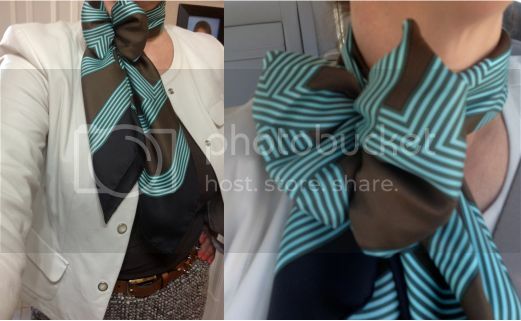 Guest post by Gina: How-to for the Papillon knot! Gina's contribution to the lastest MaiTai Collection in action collage prompted a few readers to inquire how the beautiful Papillon knot she created with her Circuit 24 Faubourg Carré was accomplished. 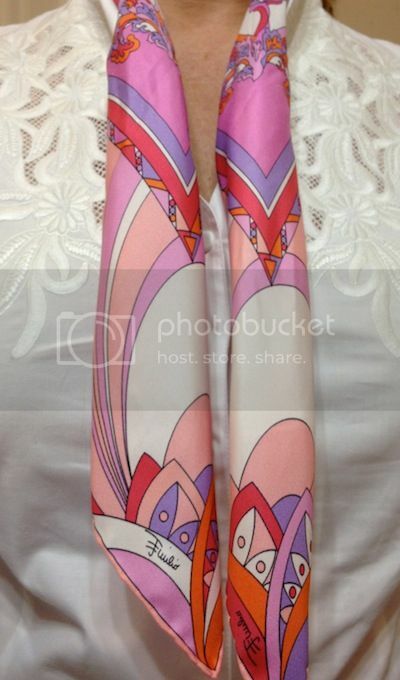 This is a 65cm Emilio Pucci scarf with a light MoP MaiTai moyenne size scarf ring. For 65-70cm scarves, I use the moyenne size (the mother-of-pearl are my favorites!) For 90cm scarves, I use the grande size. Haven't tried this yet with the shawl/shawl ring. Will give it a go next winter and see how it turns out! Drape the bias fold around your neck, I usually let one end be a little longer than the other. then pass this small knuckle of fabrice through one side of the scarf ring. Pull the "wings" so that the scarf ring lies close to your neck, but is not uncomfortable. Fluff the "wings" of your butterfly. You can make them larger or smaller to suit your mood or outfit. For a more tailored effect, I leave the "wings" small. For a more romantic look, I make the "wings" larger. Have a lovely day, and enjoy the compliments! One young man in Le Madeleine remarked "not very many people wear those things around their neck, but you look really nice". How could that NOT make you smile? Thank you Mai Tai for my lovely collection of scarf and shawl rings.! I really enjoy your blog. You are a goddess of classic style! An honor to be asked to contribute to your wonderful blog! Help.... I am fashion disabled when faced with the silk muslin shawls! 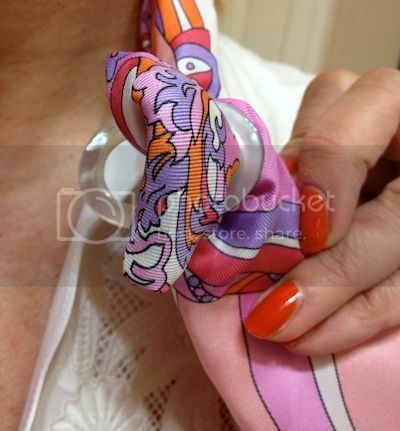 The only knot I can do is the one pictured on Hermès.com!! Have a great day Lovely Mai Tai!! Thanks for inviting me to participate! I love this blog! Looking forward to your next post!! P.S. Dearest MaiTai, thank you for your sweet and much generous words on the last post <3. Wishing you a great week ahead. Gina . . . and Mai Tai, thanks for sharing this lovely knot. Look forward to giving it a try (or tie!). Totally agree that Tai is a style goddess. 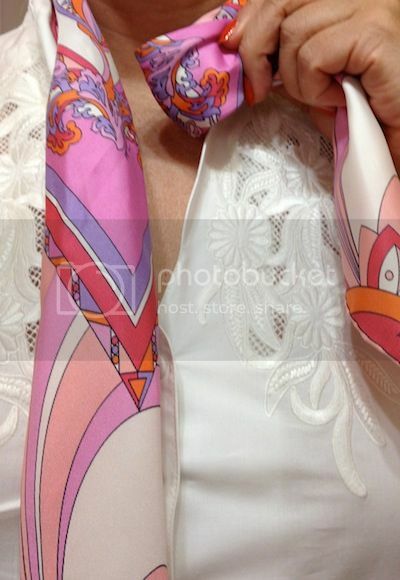 Great readers post, love the Pucci scarf to by the way, the photos really show off the colours. This is so lovely Gina ! Thank you so much, Tai and Gina, for a fully comprehensive illustrated response to "how did you do that?" ! 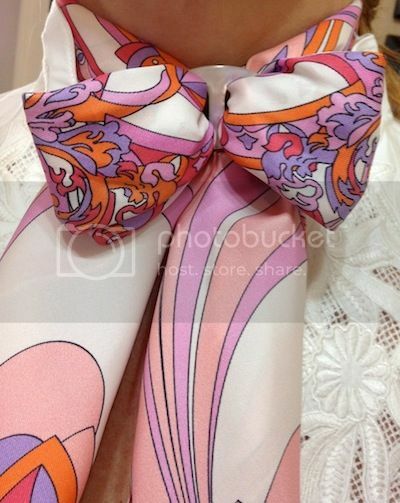 Dear ladies, so glad you enjoyed Gina's wonderful contribution, hope you are all having fun with this pretty knot!